Astronomers have discovered the largest known gas cloud in the Universe. The mammoth nebula may be the first imaged filament of a spidery arrangement of galaxies, gas and dark matter that traces the large-scale structure of the cosmos. 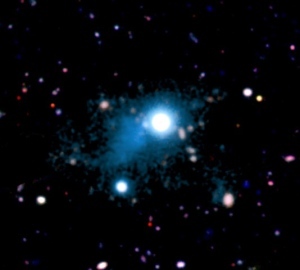 The team used a brilliant quasar, seen as it appeared when the Universe was less than 3 billion years old, to illuminate the faint gas in the beacon’s neighbourhood. The flood of light from the quasar (one of a class of intensely bright galaxy cores, thought to be black holes going through a spurt of growth) prompts hydrogen atoms in the gas to emit a characteristic wavelength of ultraviolet radiation. As the Universe expands, the radiation subsequently stretches into longer wavelengths, becoming visible light. Astronomers Sebastiano Cantalupo and Xavier Prochaska of the University of California, Santa Cruz, and their colleagues recorded that light using the Keck Observatory atop Hawaii’s Mauna Kea volcano. The Keck images reveal a gas cloud that is 460,000 parsecs (1.5 million light years) in length — or more than ten times the diameter of our own Milky Way galaxy. It is the first detection of radiation from a cloud “on scales far beyond a galaxy”, Prochaska says. The researchers describe the discovery online today in Nature.